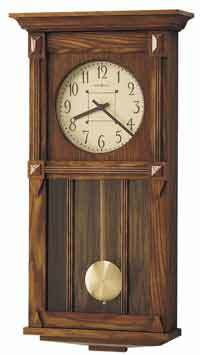 The Howard Miller Greene II 610-804 Mission Style Grandfather Clock was designed in the tradition of the Arts and Crafts Guilds, famous for their handcrafted, simple, honest, and pure design. This Mission Oak Grandfather Clock was inspired by the Greene brothers who helped develop the Arts and Crafts movement in design. "The idea was to eliminate everything unnecessary, to make the whole as direct and simple as possible, but always with the beautiful in mind as the first goal." 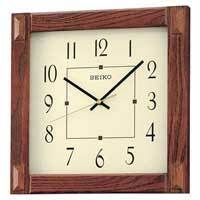 Decorative wooden molding frame the antique dial. Separate Doors for Face and pendulum access. Solid Oak reeded grilles accent the front lower door. 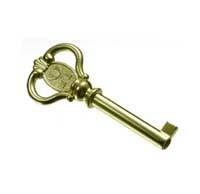 Brushed brass weights and pendulum are antiqued, along with the front locking door accessories. Satin Brass Pendulum and Weight Shells. Free engraved brass heirloom plate. German, Cable-driven, Westminster chime Kieninger movement with chime silence lever. Two Year Warranty and Free Shipping and In-Home Delivery. Size: H.79-1/2 W.25-1/2 D.14 in. Clocks for sale at The Clock Depot including the 610-804 at discount prices.